We’ve all heard the legends: wonderful, almost magical stories of speed secrets that unleash performance for a pittance. They’re usually told long after the race cars have left the protest shed and the trophies have been handed out. That’s the time when we’re most susceptible to myths about the creative stretching of the rules. No wonder some of these amazing cheats have graduated from rumor to tall tale with the passing of seasons. We’re not sure if anyone ever really turned a roll cage into a nitrous bottle, nor do we know any racer who’s actually stuck a metal ballpoint pen into the dash vent of a Showroom Stock car to trigger different fuel maps on the ECU. Not that it matters—fact or fiction, these stories make for a fun conversation over a few beers. It is said, however, that there’s a grain of truth in any urban legend. We decided to put one of our favorite rumored speed secrets to the test. One of the most persistent performance fables involves shock absorbers. Back in the day, racing rules required that Showroom Stock competitors retain their cars’ factory dampers. Racers being racers, they looked for a way to upgrade their suspensions while skirting the rules. Can a stock shock absorber’s performance really be improved by swapping its oil for thicker stuff? 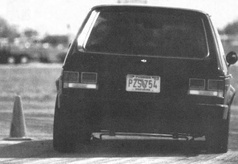 And—perhaps more importantly—can this trick be used by today’s low-buck enthusiast as an inexpensive handling upgrade? The main purpose of shock absorbers is to damp the movement of a car’s suspension springs—without them, the springs would continue to oscillate up and down, causing the car to behave like a bobblehead doll. From the outside, a shock absorber looks like merely a simple piece of tubing sporting some protrusions and fittings. Inside each shock absorber, however, there’s a shaft-mounted piston moving through oil. 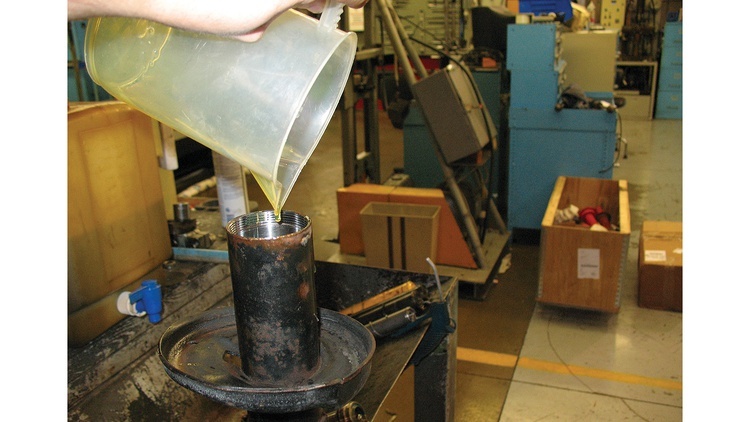 Small holes drilled through the piston itself, as well as one-way valves, determine how much force it takes for the shaft to move through the oil—and, as a result, how much force the shock exerts in resistance to movement. The fine art of shock absorber tuning involves getting those inner guts, including the oil, just right for the intended application. 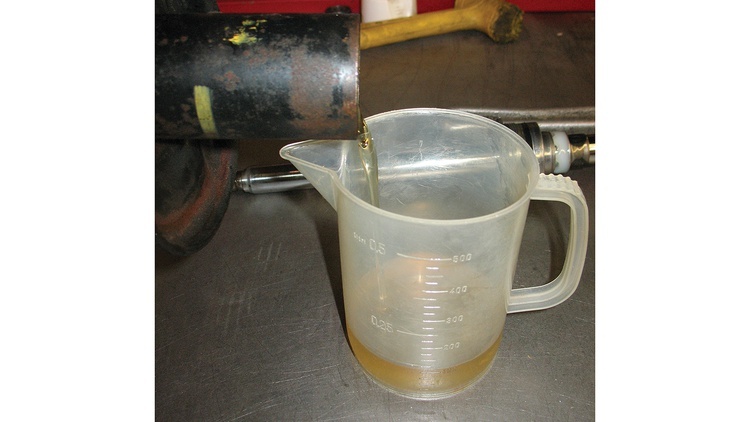 It’s generally a process left to the experts, but this speed tip is seductively simple: Just replace the original oil with higher-viscosity stuff and, in theory, the shaft will have to use more force to move. This added damping would, according to legend, provide increased composure through turns, under braking and during acceleration. Even a bone-stock car’s comfort-tuned shock absorbers would perform more like the high-dollar performance units. Could this stuff of rumors really provide a low-buck performance solution for today’s shoestring-budget racer? After all, 20 bucks’ worth of oil is a lot more palatable than a few hundred dollars for new struts. We needed a test subject and found a convenient solution on our shelf of spares. Enter a pair of factory Toyota struts removed from the rear of a 1991 MR2 that had seen more than 100,000 miles of use. 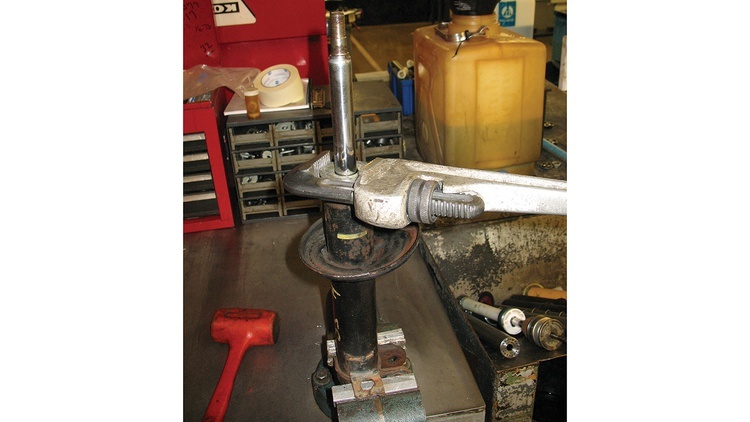 The struts were bolted to a Roehrig shock dynamometer and put through their paces. We found that despite their age and mileage, the struts functioned pretty well, generating around 300 Newtons of force at 0.1 meter/second of shaft movement. Next, it was time to start the transplant. We unscrewed the gland nut at the top of each strut body and dumped the factory fill into a graduated cylinder. Each strut held approximately 225-milliliters of fluid. The stock fluid looked thin—based on our experience, we’d guess that it was 5-weight. If doing this procedure on gas-charged units, take caution: Wrap a rag around the damper to contain the mess, and wear eye protection. Our friends in the industry warn against replacing the oil in gas-charged, monotube units. The procedure cannot be safely done at home, they stress. 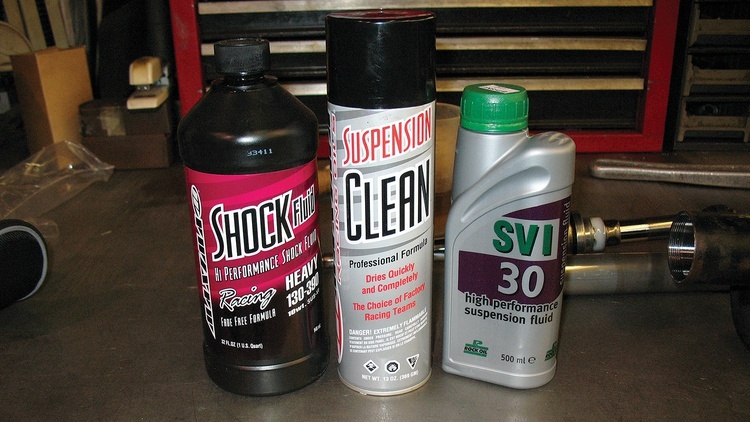 We then replaced the oil with the same amount of 10-weight synthetic shock fluid from Maxima Racing Oils. We purchased a 500-milliliter container of fluid, which was more than enough to fill both of our test struts, for a paltry $14.95. Refill the inner cylinder and then carefully reload the piston assembly to minimize air bubbles. Back on the dyno, the 10-weight oil showed about a 10-percent increase in force over the stock fluid at 0.1 meter/second. While that was an improvement over stock, we admit to feeling disappointed. The viscosity of the fluid had doubled, yet the gain was only incremental. Our next step was to replace the 10-weight oil with a much more substantial 30-weight SVI suspension fluid from Rock Oil. We purchased the 500-milliliter bottle online for just $8.90. The dyno showed that this much heavier oil really did the trick, effectively doubling our damping force at the same shaft velocity. We were now registering around 600 Newtons at 0.1 meter/second and observing a much more digressive curve, with stiffer damping at lower shaft speeds. While our laboratory data is certainly encouraging, it does come with a few asterisks. First, the fact that our Toyota struts had a screw-on gland nut made the fluid swap unusually easy. 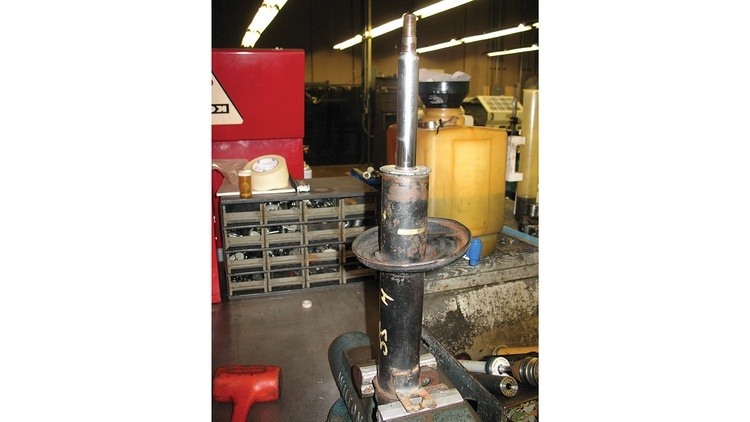 Most struts and shock absorbers are welded together and require drilling or cutting if you want to drain the oil. Then, once you’ve replaced the fluid, you have to seal up the unit somehow. Another caveat: We didn’t replace the factory gas fill. That gas is often added to prevent the oil from foaming during severe use. 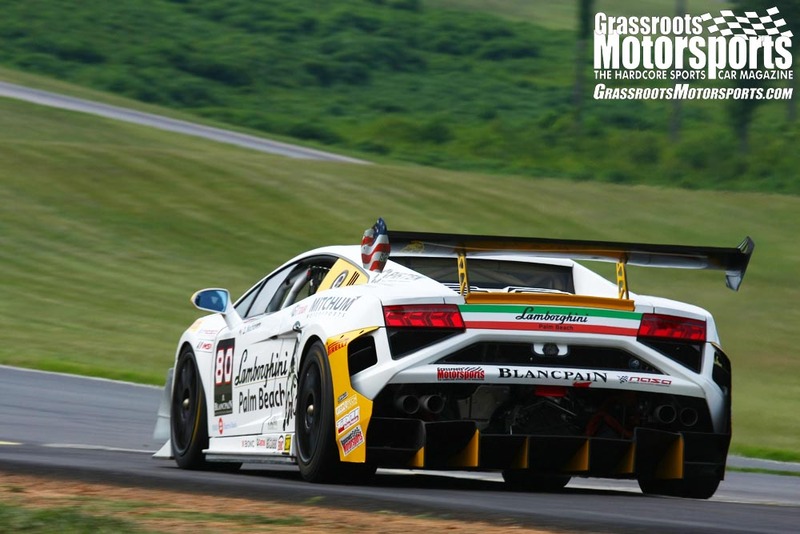 In theory, losing the gas could hurt shock absorber performance during long races; but on the other hand, most high-performance synthetic shock absorber oils are resistant to foaming. Finally, at the end of our testing, we still had a pair of old struts featuring ancient shaft seals—and who knows how long those seals will last. There’s a chance that the thicker oil will blow out those fragile seals, rendering our rehabilitated dampers worthless. Take home: message: If you’re trying to improve performance for just pocket change and navel lint, then changing your shocks’ oil may be the hot ticket for improved performance. On old British cars with lever action shocks they're refillable with a plug on the side. Tried this several years back, seat of the pants no difference. Where are you getting these legends? Who are these People?!?!? Lol. Yes I can... on my motorcycle. I think the shocks have to work before changing the oil in them will do much of anything. But does increasing the damping actually increase performance of the car? I'd guess on a lowered/stiffer sprung car yes, but that is not always the case. Most street cars are significantly under damped for performance use, in favor of better apparent ride quality. So while that may not always be the case, it probably will be most of the time for people looking into such things. Already well damped or over damped cars don't generally make people want to stiffen them up as much. for a sealed damper it seems like the ticket would be to drill a hole in the side and tap the hole for a plug to fit. cheap dampers plus good shock oil = good dampers? Wait where is it safe to drill the hole exactly? (as in is there stuff inside that won't work after I hit it with the drill bit? ) Could I drill two holes and make it adjustable with a bleeder screw and an external set of lines? I have drilled a hole in the side of a strut, welded a nut to it, reassembled the strut, filled it with motorcycle shock oil, and plugged it with a bolt and crush washer. It worked for the most part. Ended up blowing the seals out of them. I refilled the wet struts on my '85 RX-7 with ATF. Worked great, until the winter. Then the front suspension would compress with bumps and not rebound. I'd also be careful if wanting to do this on pressurized shocks. I used motorcycle fork oil on my MG level arm shocks. Went to 50 weight and found a serious increase in reaction. I changed the oil in my TR3 lever arm shocks to 30wt and changed the valve to an AH 3000 valve and found a significant increase in damping. The limitation is that it will increase both compression and rebound by the same amount. 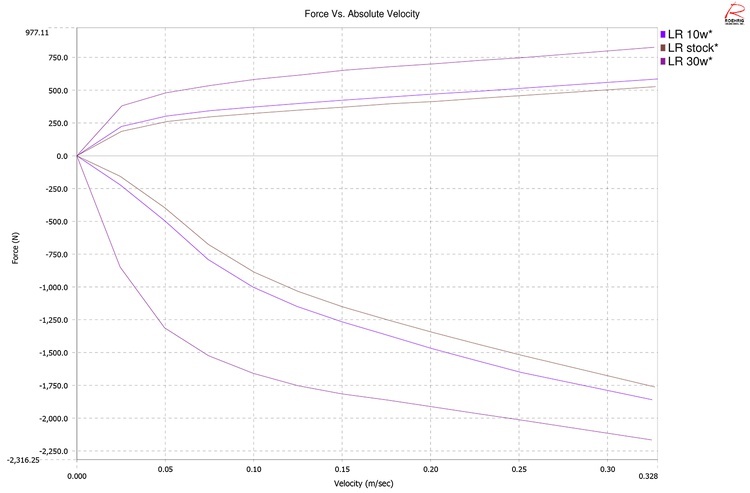 Most (good) single adjustable shocks only increase rebound for roll control. Increasing compression tends to make a bumpy ride. When increasing spring rates for performance use, the compression should be reduced and rebound increased. That's because the spring and shock work together during the compression stroke, but work against each other on rebound. Many of the "YO JDM" super coilovers adjust both compression and rebound with one knob. That may be OK in Japan where the roads are glass-smooth, but it doesn't work in the old US of All those speed bumps and potholes. Now, if you have some worn out shocks that won't go "ka-blam!" when you open them up, you can add thicker oil and get back some of the damping lost to wear. You seem to have misunderstood the explanation used to describe the general belief that there should typically be some amount more rebound than compression damping...But that is still, and always has been, based on needing to increase both proportionally to the spring rate in order to maintain the same relative damping ratios for each. I also have done this with TR6 rear lever shocks. Going from the stock rear springs (~350 lb/in) to 470 lb/in springs required more damping. The valving was adjusted per JK Jackson's recommendations, but going to 30 wt. oil really dialed them in. No more bouncy bouncy. 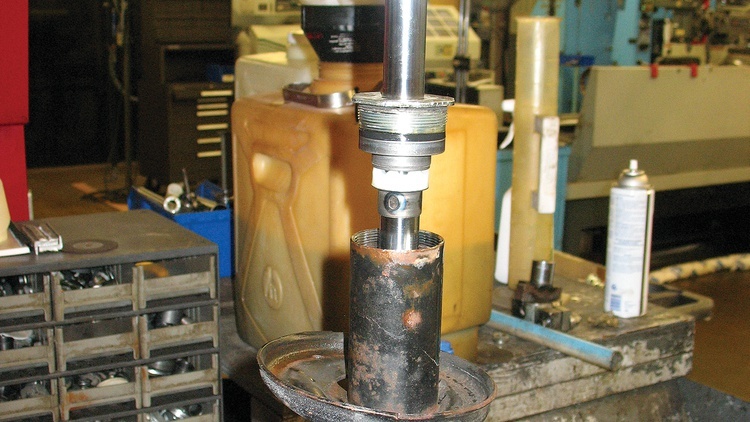 If you're drilling/tapping the pressurization in the shocks could be seen a good thing. It keeps the metal shavings from entering the shock body by putting them into your face. Just go back to friction shocks. Could be adjustable. At least friction shocks have the desirable digressive "valving" built in by nature of physics. Getting separate damping curves in compression vs rebound might be a little more difficult though. I dunno if I'd call digressive valving desirable in a lot of applications. It works on very smooth surfaces, but on pretty much anything else, it's bad IMO due to blowing through the travel way too easily on big bumps. 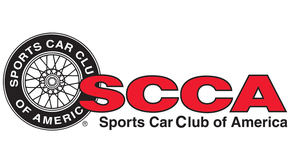 In SCCA Formula 500 (850 lbs with driver) the cost restraint for expensive coil over shocks is the use of round rubber pucks for compression in both directions; these are tunable with different durometer strengths. Add rocker arms for different multiplications and torque the rocker arm pivot bolt for different friction dampening and you have a good suspension. These low budget formula cars ($35K new and $15K used) run comparable lap times with the more expensive Formula F cars and fit the bill perfectly for grassroots motorsports. And there are two drive trains - snowmobile and motorcycle. Yeah those f-mods are pretty cool! Did this back in the early 80's on a Capri that was being preped for autocross on a very tight budget. Used motorscycle fork oil. learned this after a friend who raced in Showroom Stock road racing replaced the oil in his struts with something way thicker and blew out the seals. The stock struts could be taken apart and put back together without any holes drilled, etc. External lines and an adjustor will not do anything except give you LESS damping force, as there are already holes in the strut piston. A shock naturally has more rebound stiffness than compression stiffness, as there is more area on the blind end of the strut. More area =less pressure at equal force levels (spring rates). Most are so thin they could not be tapped and seal. It would be tricky to find a thick enough area. Perhaps the cap that's screwed off would have a large enough area. The only other option would be a bung and you can't have it where the spring rides and then you're into welding. I read a long time ago a writeup on using digressive SPRING RATES on a desert racer. The setup is, there is a low rate tender spring that is installed with a large amount of preload against a secondary spring seat that the high rate spring sits on, and is allowed to move only in one direction. The high rate spring sets the ride height, and a little below normal ride height the low rate spring comes into play. So to make nice round numbers, say the low rate spring is 100lb-in and the static load on the suspension is 500lb, the low rate spring would be installed with 5.5 inches of preload. (I hope I am describing what is happening well enough! And my source was very MUM on actual numbers so don't take these as gospel) Of course there are bumpstops in play as well. The effect was, the car was kinda harsh until you got up over a certain speed, and then it got limo-smooth over bumps. 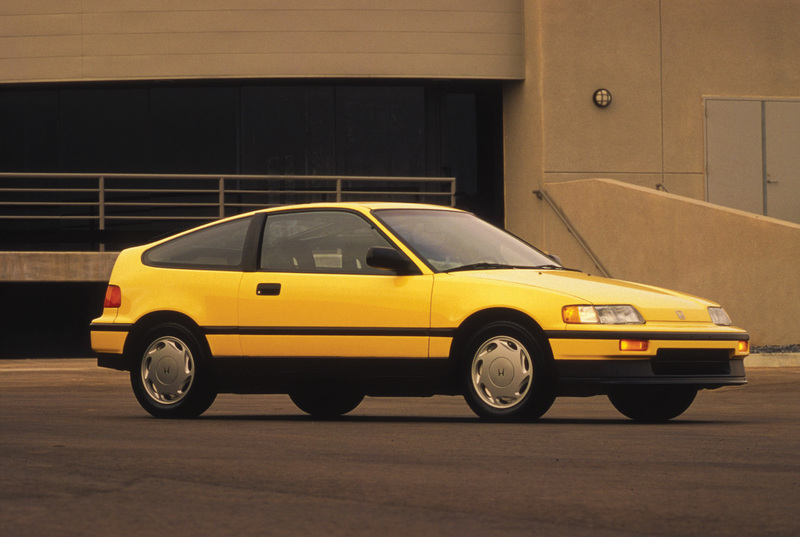 But it still had the body control characteristics of a stiffer suspension.